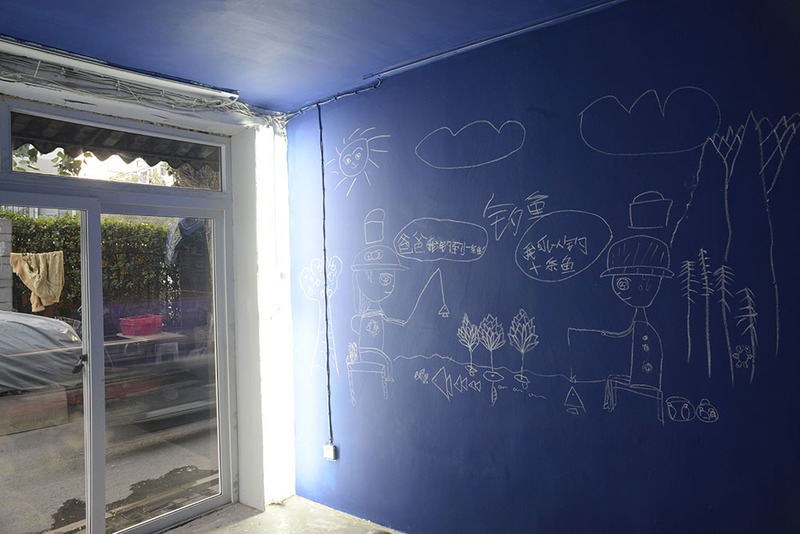 Innocent line drawings scamper on electric blue walls as billowing foam is caught suspended at its peak. Welcome to Badlands, the esoteric world of Zhao Tao, Zhang Xiuliang and Zhang Mengmeng in conjunction with the Social Sensibility Institute. In this latest installment of the Work, Live Series at Arrow Factory, tools from an industrial assembly line are co-opted for expressive rather than pragmatic ends. 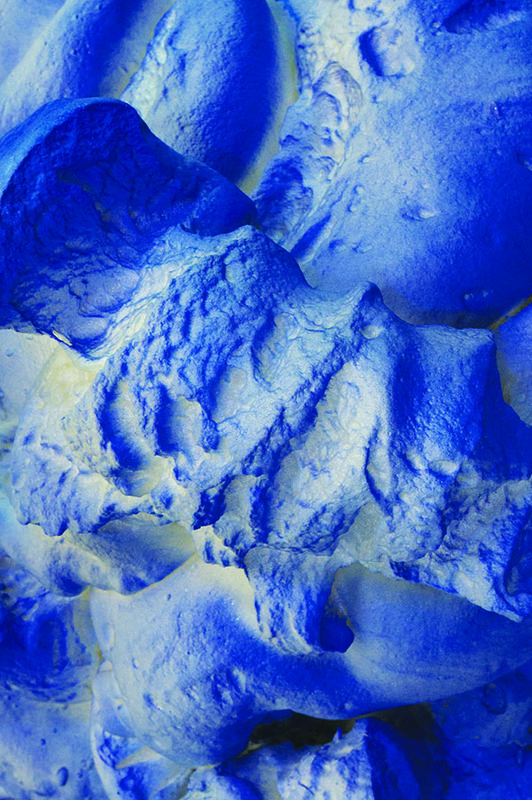 Zhao Tao unleashes a delirious rendering of industrial foam and paint. The bulbous forms re-interpret the mountainous scenery of Zhao’s hometown, conjuring for him the thrill of an extended winter hunt. 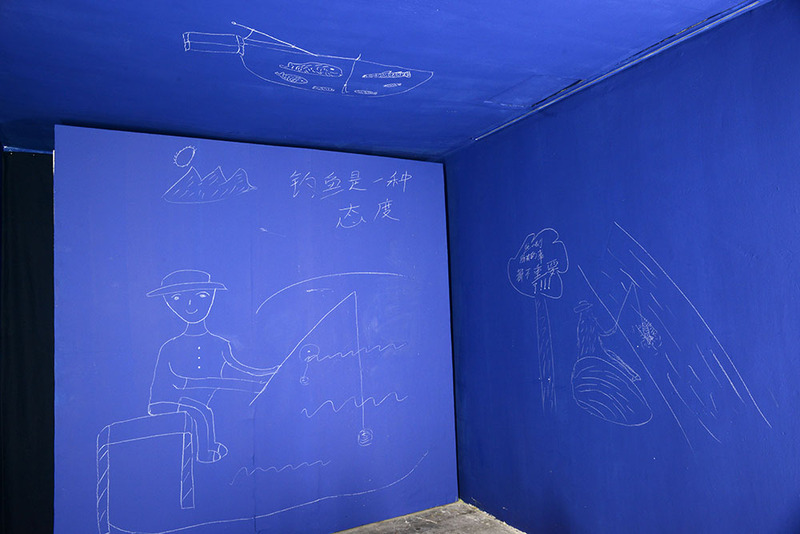 On the walls, Zhang Xiuliang’s fishing imagery symbolizes a meditative act of resistance. With the help of his daughter Zhang Mengmeng, the Zhang’s sketches depict soft rippling streams in a place where time is suspended, just beyond the demands of daily life. Vivid indigo walls take their cues from the finished products coming off the factory line. Zhao and Zhang’s allegorical escapes depict traditional forms of labor, hunting and fishing, actions that constitute “work” in agrarian societies. Reframed in a contemporary context, these ancient activities are associated with childhood landscapes, memories and leisure. 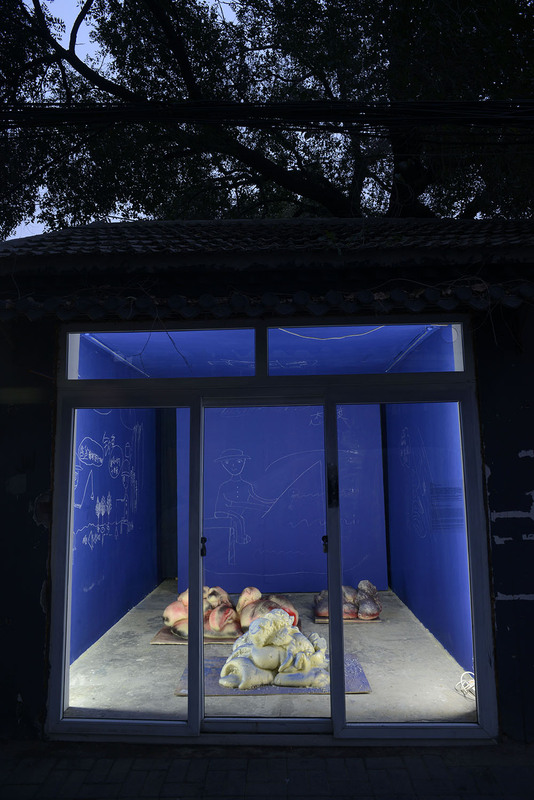 A playful subversion of the apparatus of de-humanized industrial labor, Zhao and Zhang reconfigure the by-products of the modern factory into their own idyllic experiences of nature. Hinting at ever-evolving notions of labor, Badlands layers past on present, traditional on contemporary, and truncates into a rarified space where work and pleasure entwine. Since 2011 Alessandro Rolandi has facilitated the Social Sensibility Research and Development Department, an artist-in-residency program embedded at Bernard Controls, manufacturer of electric actuators for valve automation. The department has realized numerous site-specific projects through interactions between artists and Bernard Control’s staff members. Now, collaborating with Tianji Zhao, the newly christened Social Sensibility Institute has evolved to empower the company’s employees to make original creations. 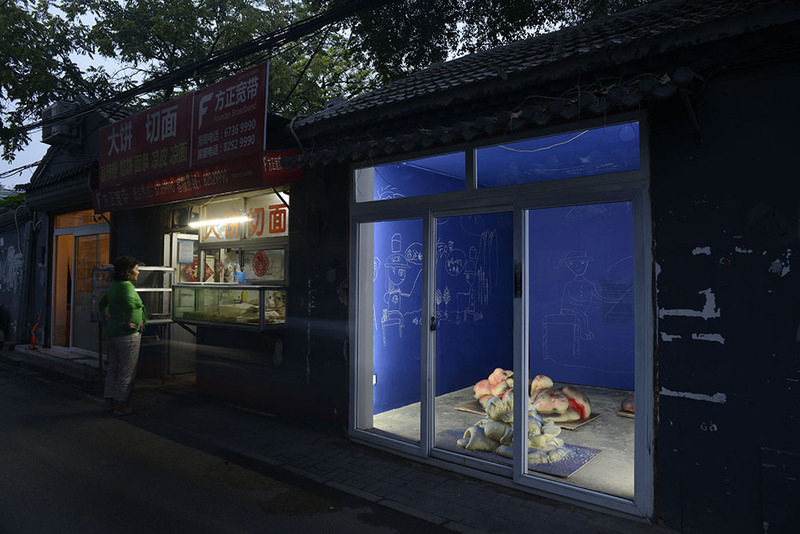 Badlands is the third project in the Work, Live Series, which brings nascent ideas from the factory floor out into Arrow Factory’s hutong context, blurring the divisions between work and private life, artist and worker, audience and creator. The Work, Live Series explores the transformative potential of creative processes and experiments with alternative definitions of authorship. Zhao Tao (b. 1987, Zhangjiakou) has been working at Bernard Controls for two years. His job on the assembly line consists of painting valve actuators and training new employees. The title, Badlands, is derived from Zhao’s sardonic description of his home village. Zhao intends to return and run for village chief with the hope of saving his hometown before it becomes desolate. Zhang Xiuliang (b. 1985, Qiqihar) has been working for five months on the assembly line at Bernard Controls. His main job is to assemble valve actuators. His daughter, Zhang Mengmeng, is nine years old.